Join the WFMT Radio Network on a musical journey to the foothills of New Mexico’s Sangre de Cristo Mountains as we present thirteen new, music-filled hours from the Santa Fe Chamber Music Festival. Over half a century, the Santa Fe Chamber Music Festival has become one of the world’s leading performing arts festivals, earning both critical praise and dedicated audiences for its lasting commitment to tradition, artistic excellence, and vision. Our series reflects the Festival’s high standards by offering a varied repertoire of superbly recorded concerts by today’s greatest classical artists. The 2019 Santa Fe Chamber Music Festival radio series features performances from the Festival’s 2018 summer season. Each broadcast hour typically contains two full-length works representing chamber music’s masterful repertoire. The Festival celebrates well-known, core works, and remains dedicated to lesser known composers and compositions, and to commissioning new works. The series host is veteran WFMT announcer Kerry Frumkin. Composer and pianist Marc Neikrug, the Santa Fe Chamber Music Festival’s artistic director, provides insightful commentary. Many of the performers share remarks about their experiences at the Festival and the music they’ve played here. Two of the premier conductors in the world return to Santa Fe this season. 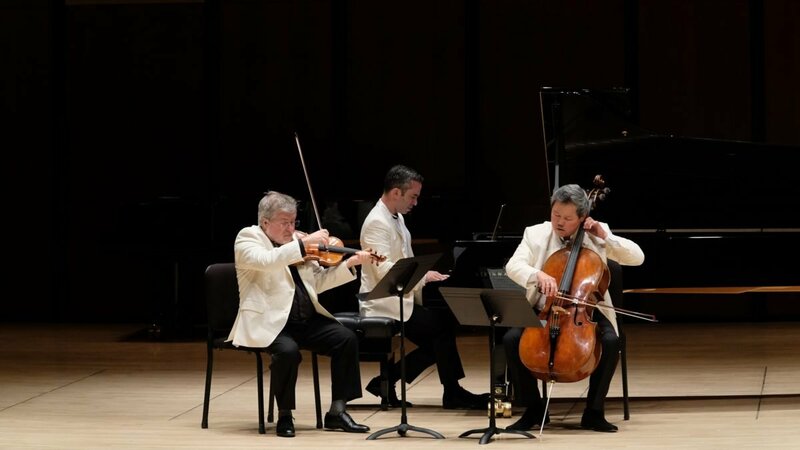 Artist-in-Residence Alan Gilbert sits in as violinist when he joins pianist Simon Crawford-Phillips, violist Manabu Suzuki, and cellist Eric Kim to perform the Fauré Piano Quartet No. 1 in C Minor, Op. 15. Lawrence Foster leads a joyful ensemble of Festival musicians along with “reciters,” soprano Lucy Shelton and actor John Rubinstein, in selections from William Walton’s Façade: An Entertainment. There will be an assortment of piano trios over the thirteen weeks. These include pianist Shai Wosner, violinist Jennifer Frautschi, and cellist Eric Kim’s performance of the Brahms Piano Trio in C Minor, Op. 101. Pianist Haochen Zhang, violinist Benny Kim, and cellist Mark Kosower will gather to play the Piano Trio in A Minor, Op. 50, “In Memory of a Great Artist” by Tchaikovsky. You’ll hear the New York Philharmonic String Quartet in late Mendelssohn when they play the Op. 80 String Quartet in F Minor. The venerable Orion String Quartet will bring forth the Schubert String Quartet in G Major, D. 887. The Dover Quartet travels from the late 18th century and the Haydn String Quartet in F Minor, Op. 20, No. 5, to the early 20th century and the String Quartet No. 2, Op. 15 by Zemlinsky. The Dovers also welcome violist Hsin-Yun Huang into the group for the String Quintet in E-flat Major, Op. 97 by Dvořák. There is a rich variety of keyboard music. Duo pianists Ran Dank and Soyeon Kate Lee appear in a selection of Waltzes for Piano, Four Hands, Op. 39 by Brahms. Haochen Zhang plays the Piano Sonata No. 1 by Pierre Boulez, Gloria Chien carries out a pair of Ligeti Piano Etudes, and harpsichordist Paolo Bordignon presents the Sonata in E Major, K. 380 by Scarlatti. And the music continues with the String Sextet in G Major, Op. 36 by Brahms, the String Quintet in F-sharp Minor, Op. 63 by Walter Braunfels, the Septet in E-flat Major, Op. 20 by Beethoven, Les citations for Oboe, Harpsichord, Bass & Percussion by Henri Dutilleux, Serenades by Dohnányi, Ravel’s Introduction & Allegro for Harp, Flute, Clarinet & String Quartet, and more. Daniel Phillips, violin and Haochen Zhang, piano close the series with the Fantasy in C Major for Violin & Piano, D. 934 by Schubert. Festival “regulars” returning to these programs include pianists Shai Wosner, Haochen Zhang, Ran Dank, and Soyeon Kate Lee; violinists Ida Kavafian, Benny Kim, Jennifer Frautschi, Harvey de Souza, Jennifer Gilbert, and Martin Beaver; violists Manabu Suzuki, Cynthia Phelps, Steven Tenenbom, Milena Pajaro-van de Stadt, and Hsin-Yun Huang; cellists Timothy Eddy, Camden Shaw, Peter Stumpf, Mark Kosower, and Eric Kim; flutists Tara Helen O’Connor and Bart Feller; clarinetists Anthony McGill and Todd Levy; bassoon players Ted Soluri and Julia Harguindey; percussionists Daniel Druckman and Gregory Zuber, and the Dover and Orion String Quartets. Music production for the Santa Fe Chamber Music Festival radio series is by Grammy award-winning recording engineer, Matthew Snyder. The series producer is Louise Frank, whose Studs Terkel: Montage of a Life garnered the Gold World Award as well as the top honor, the Grand Award, at the 2009 New York Festivals. Underwriter: The Santa Fe Chamber Music Festival broadcasts are supported in part by generous underwriting from the Ira N. Langsan & Lillian Langsan Fund in memory of Susan I. Black, and by the National Endowment for the Arts – Art Works!